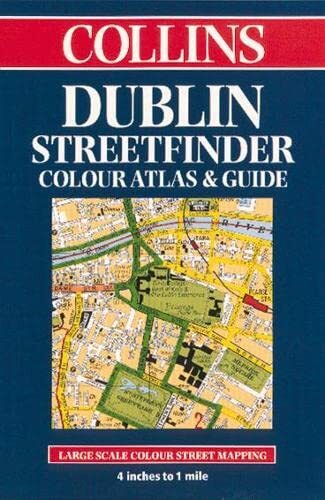 This colour atlas to Dublin includes such features as: full colour mapping with colour classified roads; route planning maps showing places of tourist interest; a full index to streets; and guide information for Dublin City. 4 inches to 1 mile 1:15,840 approx Handy full colour street atlas with guide to places of interest in Dublin. MAIN FEATURES * Clear full colour mapping with colour classified roads * Route planning maps showing places of tourist interest * Full index to streets * Guide information for Dublin City INCLUDES * Important buildings and places of interest * Car parks and railway stations AREA OF COVERAGE From Ballymun and Baldoyle in the north to Dundrum in the south, includes Castleknock and Phoenix Park in the west to the coast in the east. WHO THE PRODUCT IS AIMED AT The handy format and wealth of information in the product make it an essential purchase for visitors. The large area of coverage and clarity of the mapping will mean that residents and business users will also find it an invaluable product.